Join us at the Gallery Ten Ninety-One for the opening of our show this coming Sunday from 2-4 p.m. at 7151 Cherry Farms Road just south of I-40 at Whitten Road at The WKNO studios. Paintings, pottery and mosaics by Kristi Duckworth. Terrariums by Nancy Morrow. Show runs Monday through Friday, 9 am to 4 pm April 2-27. Call 901-828-3685 for more information or send a message below. Carnivorous Sundew plants and tillandsia bulbs, fossils and mosses all add up to a landscape from another planet! Plants are sentient, mysterious creatures from another kingdom, who will communicate with us if we can be still and pay attention. Building these Green Mansions is a long process, akin to writing poetry, I think. The colors and textures, as well as growth habits and tendencies of the plants are the palette with which I can construct the bones of a design to grow and change for years to come. I propagate many of the plants I use which gives me the time to get to know them individually, and imagine the container and companions that would be best with them. 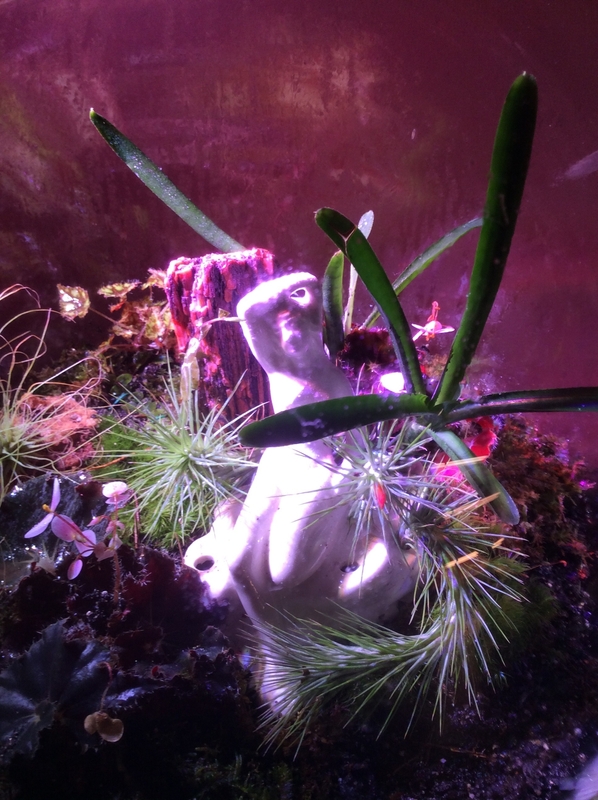 The terrariums on exhibit range in age from 2 months to 4 years. They are similar to bonsai, with the plants kept in check with careful trimming. Some of the plants are miniature or very slow growing, needing no trimming. Others can be aggressive, resulting in a design that will be much more fluid over the years as the plants compete for resources and are shaped by my hand. You can see more about this on my website, or give me a call. I open my studio to teach people about the art and science of building and maintaining terrariums, kokedama, and bonsai. In addition, I consult with people who want to learn about house plants and gardening in their own homes or offices, usually in half day sessions, and enjoy sharing my love for our green companions with people who have never considered or understood how to appreciate their beauty and life force. My students learn basic considerations for selecting plants for a particular space, and technical skills on handling, transplanting, watering, etc. which, once learned, open up the world of plants for most people to explore and enjoy.